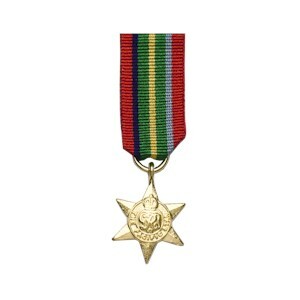 Description: The six-pointed star has a circular centre with the GRI/VI monogram, surmounted by a crown and inscribed THE PACIFIC STAR around the foot. Comments: This medal was awarded for operational service in the Pacific theatre of war from 8th December 1941 to 15th August 1945. Service with the Royal and Merchant navies in the Pacific Ocean, Indian Ocean and South China Sea and land services in these areas also qualified.